WHEN Spanish explorers first found their way to the west coast of America, the name they choose for the new-found land was plucked from fantasy. “Know ye that on the right hand of the Indies, there is an island called California, very near the Terrestrial Paradise…” declares a myth written in 1510 by Gracia Montalvo – his words inspiring the pioneers who thought they had found their own paradise. I may not have been looking for paradise as I made my own journey west, but I was hoping to find the lesser-seen California – the land behind the glitz and the commerce. Flying into San Francisco and snagging a rental car, I headed north and based myself near Vallejo for the holiday –a handy base for exploring. Tourist trap or not, it would be wrong to ignore San Francisco. The city boasts the largest Chinatown outside of Asia. Compared to the brisk, business-like streets elsewhere in the city, this is a hubbub – with shops spilling their offerings onto the street, even live fish splashing away as fresh water bubbled through their shallow tanks. The constant sound of traders calling to one another or the magical street musicians, and the wash of different scents make this a treat for the senses. Sure you can hop on one of the famous trams, but going on foot will help you find the oddities – from the beautiful, pure white walls of the church of St Peter and St Paul or the remarkable Cupid’s Span sculpture of a giant bow and arrow to the odd couple of the Bank of America, where you can invest a fortune, and the palm reader next door, where you can have one told. If you’re headed to the city, you’re as well off using the Metro or hopping a ferry – traffic is a slow grind to be avoided. Next up came the Napa Valley, where I joined friends to dip into some of the vineyards which make the area famous. I’m not a wine drinker myself, but that made the experience no less pleasant, as the scents of Carneros Chardonnay rubbed shoulders with Dry Jonannisberg Riesling, and Duarte Zinfandel snuggled next to Gaovay Rouge. There was a buzz and bustle at the V. Sattui winery, while the amiable and knowledgeable staff at the White Hills vinery made a pleasant end to the trip. Those not wanting to travel by car can hop on the wine train – more information can be found at www.winetrain.com, but make sure you know if your ticket cost includes tastings before you hop aboard. It was time to head away from the mainstream, and a couple of turns away from the freeway brings you to the secluded Mt Diablo. This is a holy place, whose summit has long been a destination for pilgrimages by Californian Indians. The Miwok people tell of how this was the birthplace of Wek-wek, the father of the Miwok race, himself the offspring of a condor and his rocky perch upon the mountain itself. Warning signs will urge walkers to beware rattlesnakes and spiders, but that shouldn’t put a prepared walker off. Winding trails left me both exhausted and exhilarated – I tell myself it was the views that were breathtaking and not the steep climbs. Reach the 3,849ft summit and you’ll find views stretching beyond the Golden Gate Bridge. That night, I headed for the Starry Plough, an Irish pub in Berkeley – a town of book shops, tattoo parlours, incense stores and other oddities. For over 25 years, the Plough has hosted Irish dancing nights every Monday night, complete with lessons at 7pm for beginners. It was the perfect way to unwind – though I appreciated my forgiving dance partners – and is well worth a stop, whether to join in the swirl and swish or merely admire from the sidelines. More walking was my plan the next day as I headed towards Mt Tamalpais, just to the north of the Golden Gate Bridge. One thing I’d missed at Diablo was the greenery, the sun having scorched much of the landscape to brown. But at Mt Tamalpais, the green was nestling. I took the Panoramic Highway and, though I'd intended to pull over and go trail walking, the road whispered promises of more beauty around each corner, and delivered at every turn. By gasps and marvels and would-you-look-at-thats, I finally found myself deposited at the far end of the road and the shores of Stinson Beach, where the Pacific beached itself with a constant sound of low, rumbling thunder. Shoes off, socks off and paddling through the ocean I went, as families chased frisbees and young men impressing their young ladies by throwing themselves into the sea on boards. Peaceful, beautiful and brilliant – so much so that I found my way along this route again later in the holiday, but edging farther down the road to the bleaker landscape of Port Reyes and the bellowing lighthouse whose one blinking eye warns when the infamous fogs fold themselves in around the coastline. Next up came one of California’s oddities. 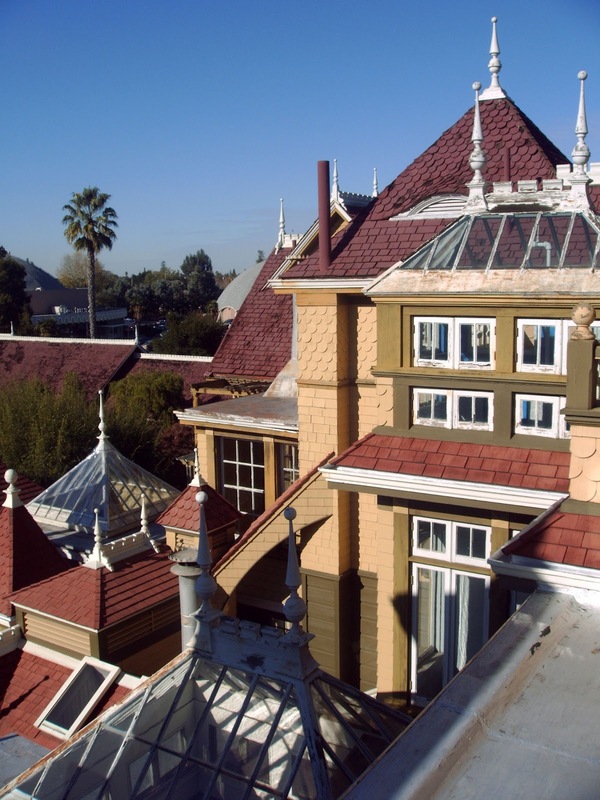 You’ll find the Winchester Mystery House (pictured below) in San Jose, off to the south. 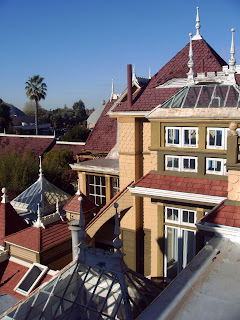 This was built by Sarah Winchester, the widow of the founder of the Winchester rifle company. Seeking an explanation for his death and that of their baby daughter, Mrs Winchester called on a medium in Boston. The medium told her the deaths had been caused by the spirits of those killed by Winchester rifles and the only way she could avoid the same fate was to constantly build a house so the spirits could never find their way to her. For the rest of her days, construction never ceased, and the results are baffling. Staircases end in ceilings, windows are set in floors and doorways open onto thin air – but the house didn’t bring Sarah the promised eternal life. She died in 1922, and workers set down their tools the moment they heard the news – carpenters even leaving nails half-driven. What remains is a sprawling, nonsensical, 160-room mansion that confounds and confuses at every turn. If you’ve headed this far south, edge on down to Santa Cruz and take in the boardwalk at sunset. This beachfront is lined with amusement arcades and funpark rides. Head along the pier and you’ll find sea lions honking their own approval of the setting sun. I also found more dancing, a Salsa class to busy the toes at the end of the boardwalk. 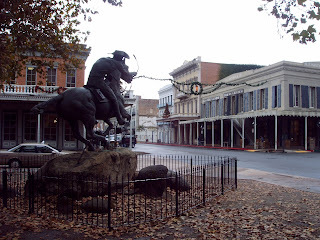 Days were beginning to run out – and aside from a quick trip to Old Sacramento (pictured top), which looks like it just materialised out of an old western – I had one more destination in mind. Heading north again brings you to Lake Berryessa, a beautiful, pristine landscape surrounding a 26-mile-long and three-mile-wide slice of perfection. Birdwatchers can keep an eye peeled for Bald Eagles or American Kestrels, but the landscape itself is more than enough to look at. A winding road will lead you around its edge, through communities where you can snag a bite to eat or a boat to hire. Find a place to pull over away from those, though, and just breathe in the peace and serenity. This was the California I’d come looking for – the land itself in all its beauty and not the non-stop attractions people have built upon it. Maybe, just maybe, I can understand now why those early explorers thought they had found their paradise.